John Ross' first NFL catch was a TD. Tyler Boyd says he’s looking at Chad Johnson touchdown celebrations from the previous decade to get inspiration if he gets into the end zone Sunday (1 p.m.-Cincinnati’s Channel 19, purchase tickets) against the Saints at Paul Brown Stadium in continuing the NFL’s salute to the old-time diva receivers. But with no one expecting A.J. Green to play Sunday, it’s time for the younger receivers behind Green and Boyd to look at Johnson’s first 19 games during his first two years in the league, when he got into the end zone just twice. Guys like 2017 draft picks John Ross and Josh Malone can take to heart the frustrating experiences of The Ocho. Before the marriage proposal celebration, there was discord. Even the Bengals all-time leading receiver, six-time Pro Bowler and cultural icon struggled early on. Because except for Green and a handful of others, that’s what young wide receivers do when they get to the NFL. Ross, who hasn’t been able to stay healthy, tries it again after missing three of the last four games with a groin problem and 16 of his possible 24 NFL games with a variety of ailments. Malone, who has played in every game but one this season after being inactive for the first five games of his career last year, is credited with just one target and one catch for four yards in 2018, but is best known for having a pass tip off his hands in Carolina for an interception. 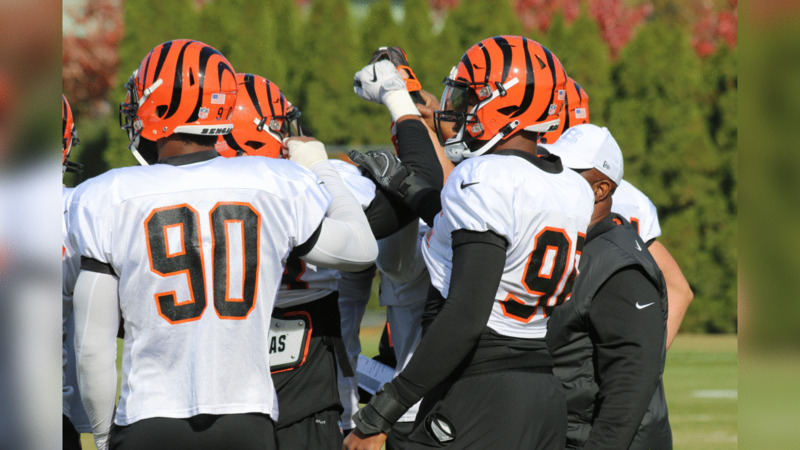 You don’t have to know how to split the atom to figure out how to split up what happens Sunday to help the Bengals to win. Of the 184 targets to wide receivers, all but 42 have gone to Green and Boyd. With Green looking like he’s out, tight end Tyler Kroft definitely out, running back Giovani Bernard probably out, tight end C.J. Uzomah definitely struggling and tight end Tyler Eifert long gone, the young receivers have to make something happen. They haven’t done much. Combined, Ross and Malone have 14 catches for 154 yards and three touchdowns on 39 targets in 26 games. But we’re talking young wide receivers. The Ocho? Coming into his break-out game early in his second year in his 20th game (he’d been hurt for four games as a rookie), he had 33 catches on 84 targets with two TDs. Bicknell, who isn’t in his first rodeo, has seen it all before and he’s not worried about the kids. In fact, walking off the field Wednesday he thought they all had a terrific practice and clearly responded to Green’s absence.  He has coached in the pros for 18 years on two different continents and at three different positions on offense and he’ll tell you Wednesday what he’s always told you about NFL receivers. Three years. If it’s going to happen, it’s usually in that third year. Look at this week’s list of the top 50 NFL receiving yardage leaders. A first- or second-year wide receiver doesn’t appear until the 15th spot and Pittsburgh’s JuJu Smith-Schuster. There are four second-year receivers in the top 50 and two rookies. Joining Boyd figures to be the third-year Erickson (eight catches) and the second-year Ross (seven) if he can. The third-year Core (three catches) also figures to be active because of special teams. If it goes down like it usually has, they’ll have the second-year Malone (one catch) active and deactivate the rookie Tate, still looking to make his NFL debut. The intriguing guys are Ross, a first-rounder, and Malone, a fourth-rounder. There’s a pretty good chance they’ll be the two fastest guys on the field. Malone may have run the quietest 4.4-flat 40-yard dash in NFL scouting combine history. He was the first guy in a group that had Ross, already arriving in Indy with the flurry of a presumptive presidential nominee at a convention as he sought to run the fastest combine 40 ever. After Malone finished his 40 and started walking back to the group, everybody was suddenly going nuts. He caught the monitor flashing 4.22 and he was wondering who the heck it was. So all this stuff about people stepping up and in and out, Ross does it every day, every game. Ross re-aggravated a groin injury in the Oct. 21 game in Kansas City, but he says it may be stronger now that he didn’t play in the last game against Tampa Bay. Ross got hurt back on Sept. 30 during what stands as the longest TD catch by a wide receiver at 39 yards. Josh Malone working against the Lions late last season. For Bicknell, it’s a pretty easy call. Boyd had a superb rookie year. Last year wasn’t so good. But the third year finds him on pace for 98 catches, Green’s career year. “I just trusted my ability. I would gamble on myself more than anybody else,” Boyd said. “I still feel pretty comfortable even though A.J. is down, but it still hurts as a team. We just need guys to step up and fill his shoes and keep a smile on his face to show we have guys that can help him and get the job done."